After the long and cold winter, here we finally present calm and delicate spring atmospheres. Like any talented musician, Aleks prefers to stay incognito, but his music says more than any word. In 2004, Aleks finished the self-published album, dedicated to, and inspired by paintings of the Latvian artist Valerija Shuvalova. 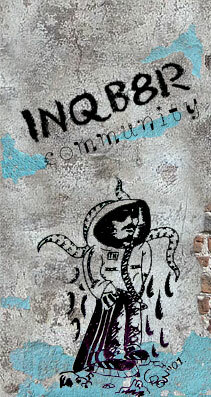 His presentation for INQB8R is based mostly on those recordings, taking older tapes from 1996-2006 and adding completely new notes specially for this refurbished release, which we have worked on together for about 2 months. Just a good example showing the real feeling of music never expires. That's great release - calm, peaceful, sad and optimistic at once. Just for my current mood! There is one question though. In the end,the last track "faam land", the author (?) says something... what does those words mean? The words are said in Russian, and they mean (approx. ): "...I would like they would be a bit bigger!" "...they (waves) would rather be a little bigger"
"... water is everywhere. The Sea. " Again experimental music webzine Sound Proector noticed our release, and we are re-publishing it with pleasure! Winter hasn't left yet and spring hasn't come. The sun is shining brighter, ice started to thaw but in the evening it's still quite cold. 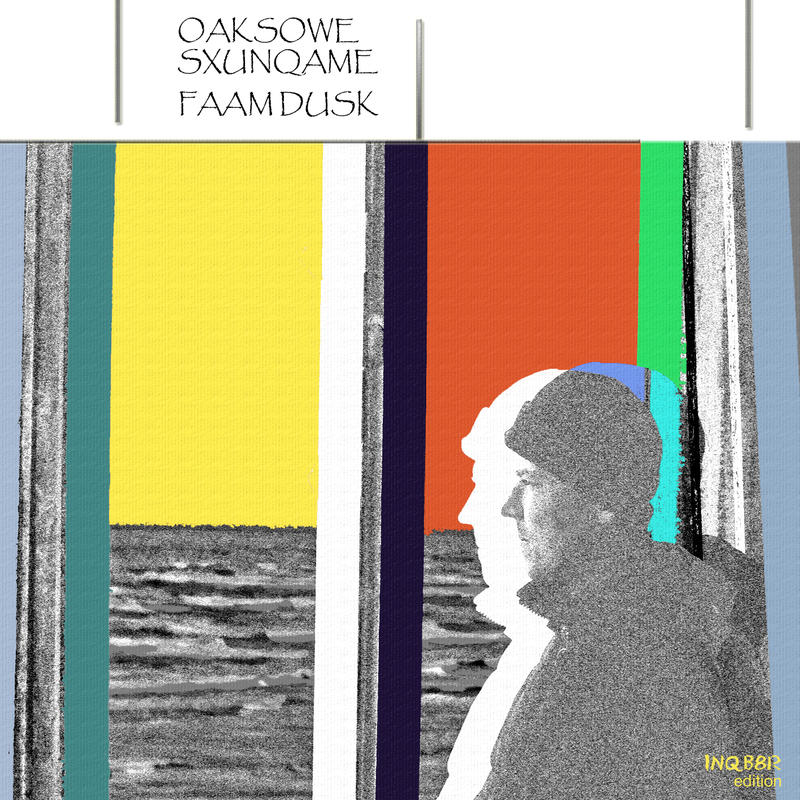 At the end of February net label INQB8R prepared and released the album of the project Oaksowe Sxunqame - Faam Dusk, and it has fixed in time and space the feeling of ambient reshuffle by winter-spring duet. For long we hadn't heard music which stands in parallel to the works of Brian Eno and some projects by Vincent Clarke. Exactly in parallel, but not similar, not repetitive, but living and making its own way to the stars. In composition "Faam Dedication" we can hear how seriously, delicately and subtly the musician can work at his sketches. Slight careful interference leads the ambient sound to spreading into layers like puff pastry, showing its sweet filling. Needless to say, but it's beautiful. By the way, all I know about the musician is that his name is Aleks and that he has recorded this music being inspired by the pictures of Valeria Shuvalova. Apparently, this musician wants to stay incognito, so people could listen to his music without comparing it with anything and pinning a label. Though it's really a modest and worthy position, a few of those people who are recording are able to do so. My favorite sketch of the whole release is the last composition "Faam Land". I like its fairy-slow starting and continuation, I like the words appearing: "the fourteenth, sixth month, water all around, sea..." (translation from Russian). Зима еще не успела уйти, весна еще не смогла наступить. Солнце светит все ярче, лед начинает таять, но по вечерам все еще ощутимо холодно. В конце февраля сетевой лейбл INQB8R подготовил и выпустил релиз от проекта Oaksowe Sxungame - Faam Dusk и словно бы зафиксировал во времени и пространстве ощущение эмбиентной рокировки дуэта зима-весна. Давно мы не слышали музыки, параллельной работам Брайана Ино и некоторым проектам Винсента Кларка. Именно параллельной, не похожей, не повторяющейся, а самостоятельно живущей и растущей в сторону звезд. На композиции "Faam Dedication" можно услышать насколько серьезно, аккуратно и тонко музыкант может работать над своими зарисовками. Небольшое осторожное вмешательство и эмбиентный саунд просто расслаивается как слоеный пирог, открывая свое сладкое содержимое. Красиво, ничего не скажешь. Кстати, о музыканте мне известно лишь то, что его зовут Aleks, и что он записал эту музыку, вдохновившись картинами художницы Валерии Шуваловой. По всей видимости, музыкант хочет оставаться инкогнито и также хочет, чтобы люди слушали музыку, а не привязывали ее к чему-то и вешали ярлыки. Впрочем, это действительно скромная и достойная позиция, немногие из тех, кто что-то записывают на это способны. Моя самая любимая зарисовка со всего выпуска ? это последняя композиция "Faam Land". Мне нравится ее сказочное медленное начало и продолжение, нравится появление слов: "Четырнадцатое число, шестой месяц, везде вода, море...". До лета осталось не так далеко. My opinion is this video is perfect... there's a behind story of it when I tried to do the same this year in Spain, i.e. to film skies and then fastforward them. In result I just watched it on my camera on 3x speed and was astonished, Alex filmed the whole track on himself on 10x speed at least... I wonder how much patience and time it took him, and the time is the most important actor in this video. Actually you may see there is no time at all; and even if that is, it could exist without us. And when you remove the time, you see more widely how beautiful our planet is... it's perfect from any angle, all the time. P.S. You may check the "improved" version of the video on Vimeo. What we have here is a very first director's cut. It's another genre... but it's filmed in Ireland, like their first video, specifically in Dublin. This music brought me back to 70s... its spirit is the past.